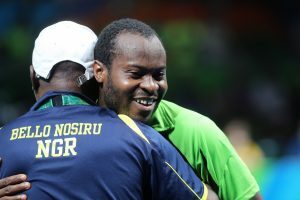 In this Rio Review Nigerian superstar Quadri Aruna talks about how the Rio Olympic Games was the best tournament of career, and how the event led to new found fame. “It’s exactly one year since I recorded my best results so far in my career,” says Quadri Aruna. 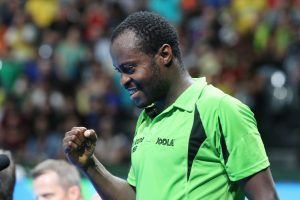 Nigeria’s best table tennis player looks back on last year’s Olympic Games experiences as the best moment of his competitive life. And why shouldn’t he? As Africa’s best table tennis player, he proved that table tennis greatness is just to be left in the hands of Asia and Europe. So just how good was Quadri Aruna in Rio? 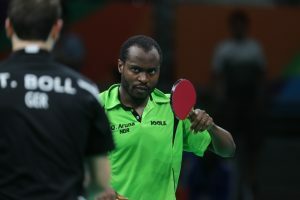 The man from Nigeria consecutively defeated Chuang Chih-Yuan and Timo Boll. Chuang he dealt with a confident briskness. The scoreline was 4-0. Against Boll Aruna raced to a 3-0 lead and was close to recording another victory with clean sheet. Boll held his nerve and managed to claw back two games on the board, but the Nigerian powerhouse wasn’t letting the match slip from his grasp and took the sixth game 11-9. To the world’s amazement, Quadri Aruna was in to the quarterfinal of the Rio Olympic Games. Who was it that halted him in his tracks? None other than eventual gold medallist and Grand Slam winner Ma Long. It took the best player in the world to stop Quadri Aruna’s run in Rio. After the Games the success didn’t stop. Aruna’s performance garnered him a lot of fans, not just in Nigeria but all over the world, particularly in the digital sphere. For the meme generation, medals at the Olympics isn’t the only measure of success. The Olympic Games provided the springboard for Aruna to start bringing his unique table tennis stylings to the whole world. But it’s not all fortune and glory. By proving himself on the biggest sporting stage, the world stood up and took notice of the Aruna’s remarkable abilities. It wasn’t just a one off lucky day, the Nigerian proved he was able to compete with and beat the best. No doubt this has further developed his play and provided daily access to some of the best coaches and players in the world. No doubt Quadri Aruna will continue to look back on Rio 2016 as one of the most important chapters in his playing career.